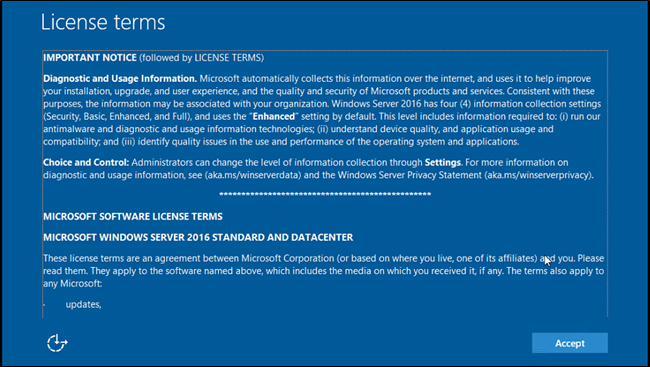 With Server 2016 and 2019, there is now a third option, Cloud Witness. 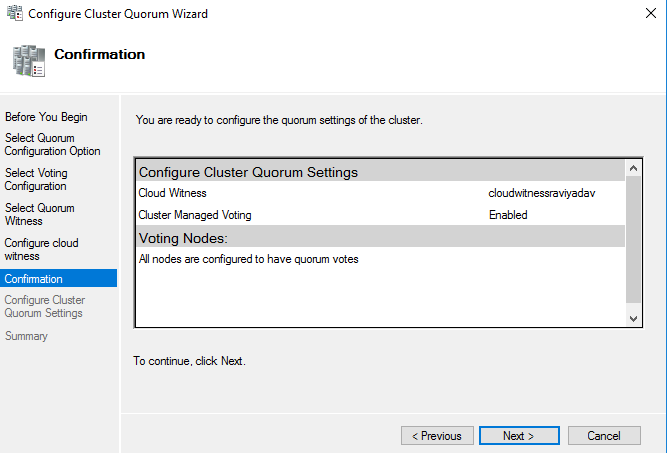 The Cloud Witness leverages Azure Blob storage to provide that additional cluster/quorum vote. 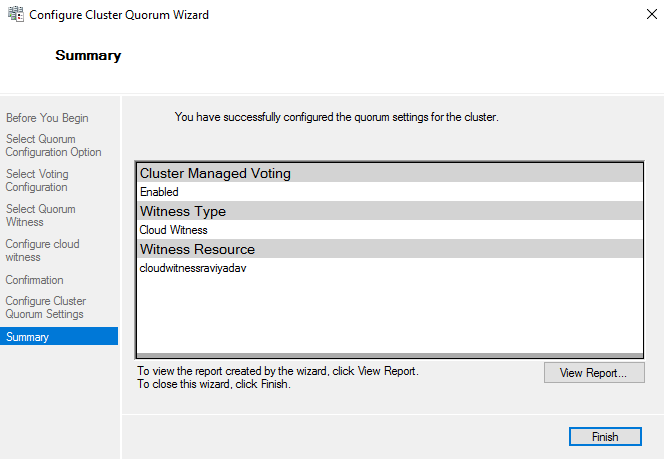 Before showing you how this is done, one should understand the purpose of a witness/quorum is with respect to a failover cluster. When one or more members of a cluster stops reporting to the other cluster members, there is a vote. The vote ensures that there is no split-vote, and ensures the cluster has a true owner. For example, in a two node cluster, if each node believe it is the owner, then this will cause a “split-brain”. In short, neither node will ever agree it is the owner (or not). This is where a quorum is required to determine who is the owner by providing the third vote, ie. majority. This ensures the cluster has a true owner by having the majority of votes. Each member gets a vote, plus the quorum. Why this matters, in the even there is no quorum, a node from the cluster can be evicted and as a result will suspend all application services to prevent data corruption by more than one system writing data without the cluster services coordinating data writes and access. 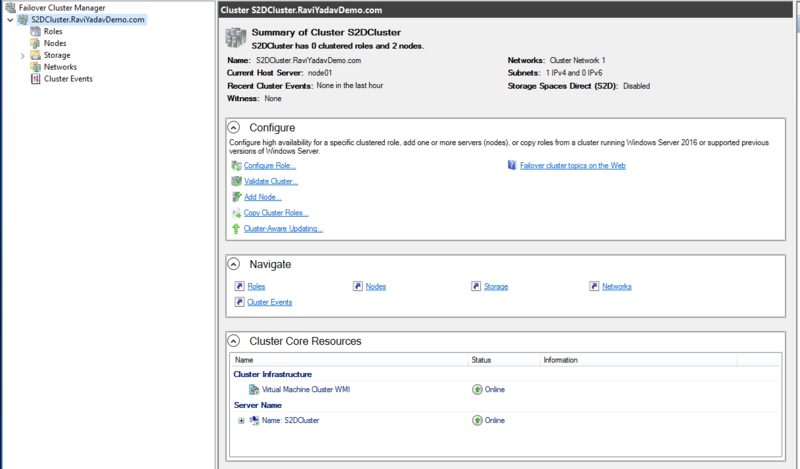 Depending on policies, VMs running on the ejected cluster member will either suspend operations or be migrated to other nodes before being ejected. 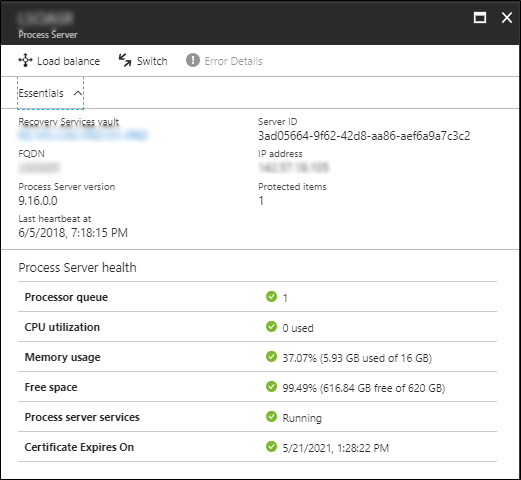 Below is a step-by-step guide on how to configure the Azure Blob storage as the Cloud Witness. The cluster with at least 2 nodes already exists. 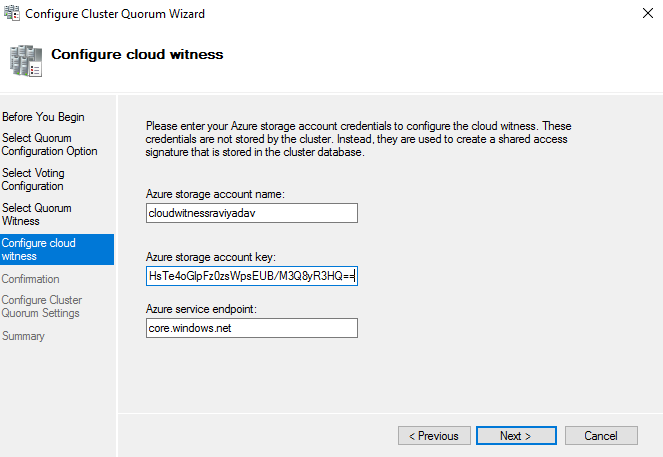 Set-ClusterQuorum -CloudWitness -AccountName "storage_account_name" -AccessKey "primary_access_key"
Now if we go back to the Failover Manager console we can see we have successfully configured cluster with a Cloud Witness. In conclusion, deploying a Cloud Witness for a Failover Cluster is very simple, and in case of power outage in one datacenter, maintenance on a node, etc. then the entire cluster and its members (nodes) are all given an equal opportunity. 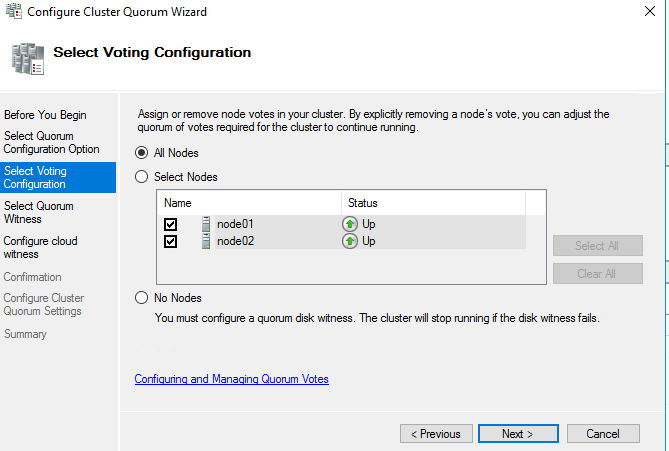 Not only is it recommended and a requirement for 2-node clusters, but for any number of nodes, having a quorum is key ensuring high-availability. As mentioned, there are the traditional options such as using a dedicated disk or a file-share (SMB) as the cluster witness. 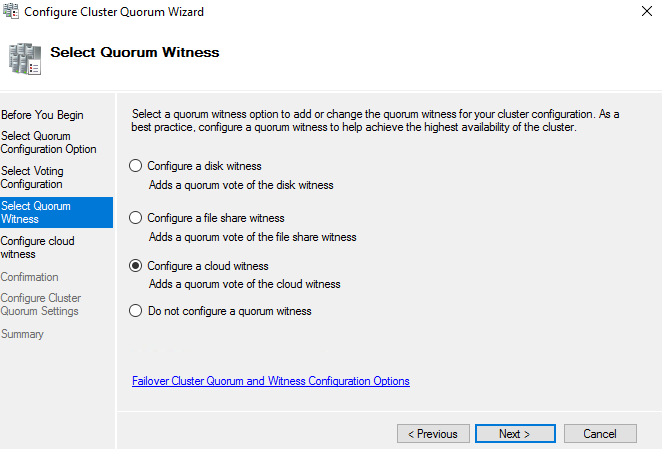 However with Azure Blob storage with its 16×9 uptime, we can always ensure the quorum witness is online and available. 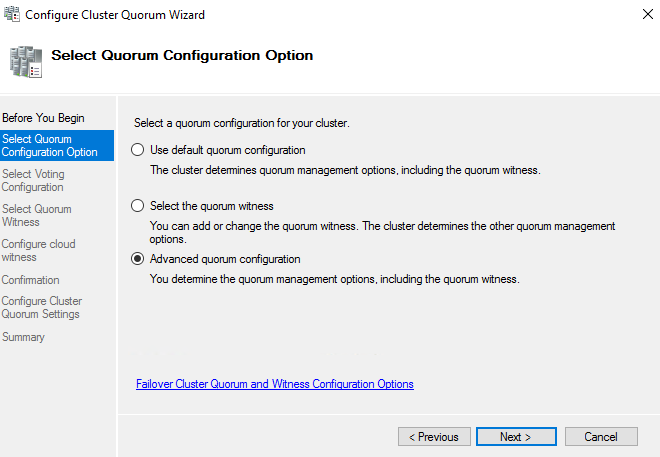 Next select the Advanced Quorum configuration.. Ensure we have all the nodes selected, as seen below. 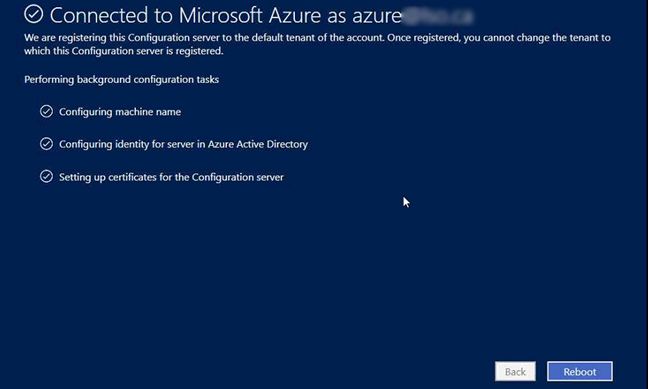 Now we need to get our Azure Blob storage account name, and its primary account key. This can be retrieved from the Azure portal. Now validate the settings and complete the configuration. Earlier this month, Microsoft announced that the SCOM’s (Operations Manager) GSM (Global Service Monitor) will officially call it quits and retire the service, effectively, November 7th, 2018. As it is a sad day for us, long-time SCOM administrators, the future remains bright, as Microsoft makes way for Application Insights. Over the last year or so, I have done numerous presentations and conferences on Azure’s Application Insights (App Insights), and demonstrating the natural evolution from SCOM APM to Azure App Insights. However, before we start talking about Azure’s App Insights, we need to start thinking about migrate away from GSM. If you don’t know, GSM, Global Service Monitor in System Center Operations Manager provides the ability to monitor the availability of external web-based applications from multiple locations throughout the world. Microsoft Azure has this feature already within App Insights, called, “Availability“. Creative, I know.. But it does exactly that, measures the availability of your application. Fellow MVP, Kevin Greene wrote an amazing, and in-depth article on how to migrate your application and GSM to Azure App Insights, so please have a read here. Over the next few blog posts, I would like to provide some detailed demos on Application Insights and how you can start taking advantage of this service to start monitoring your applications. 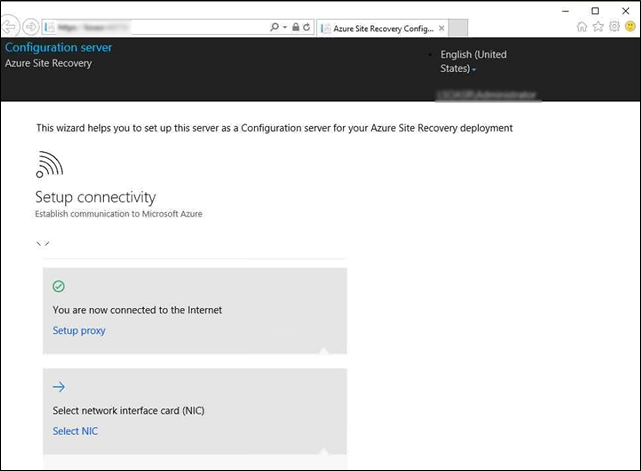 In the following tutorial, I will go through a step-by-step walk-through on deploying the Azure Site Recovery (ASR) VMware OVF template. 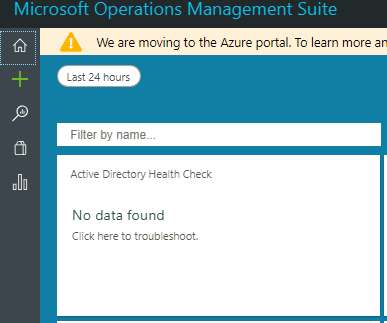 This OVF template is a critical step as it bridges the connection between your On-Premises datacenter and the Azure Site Recovery Vault. Obviously there are a handful of prerequisites, as we need to prepare our VMware environment in addition, prepare our Azure workspace. 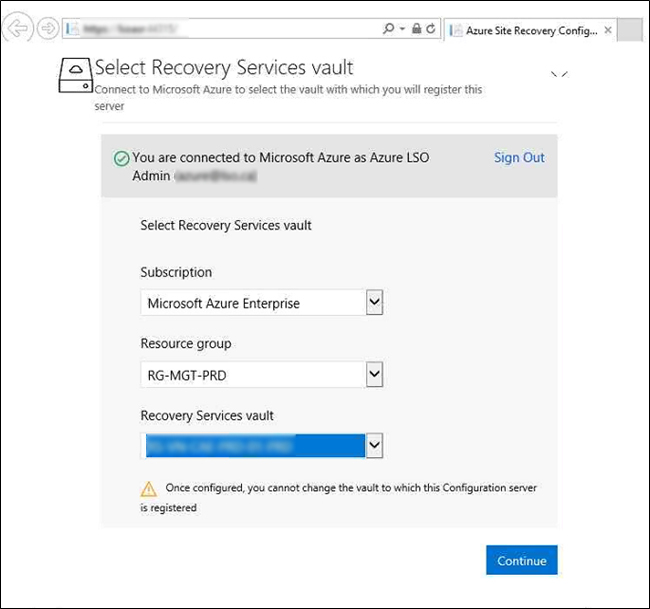 I have created similar posts for Hyper-V and Azure to Azure (A2A) ASR Migrations, please visit the following link for the detailed setups of the Azure Recovery Services Vault HERE. Let’s begin… The first step is to download and install the VMware OVF template. The VMware OVF template can be found at the Microsoft Download Center. Next, we need to deploy the OVF template within vCenter. Note, this template will consuming about 1.5TB of space. This is a result of Microsoft consolidating the Configuration server and Process server into one workload. Once the template is deployed, start the appliance and let’s begin registering our vCenter with ASR vault. Note, the licence provided with OVF template is an evaluation licence valid for 180 days. 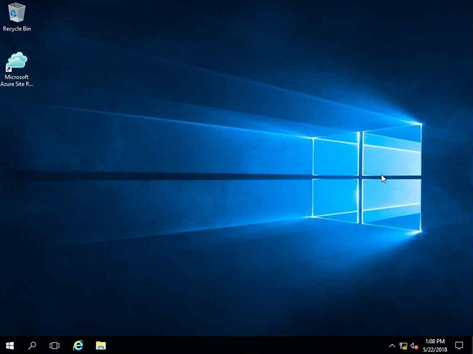 You as the customer need to activate the windows with a procured licence. Now we need to provide the server with some local administrative credentials. Once you have given it some credentials, the server will auto login. The ASR wizard should launch on its own, if not, you can launch it manually — the icon should be on the desktop. Once the ASR wizard starts, we will now need to complete the setup for this server following by registering the server with ASR. 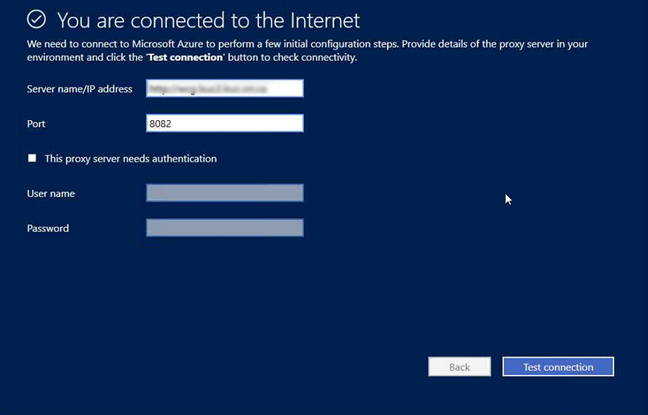 Next, we need to validate the server can go over the Internet, ie. Azure and communicate as needed. If you are using a proxy, here is the time to set that up. One thing to note, having the proxy settings configured within Internet Explorer should be removed. 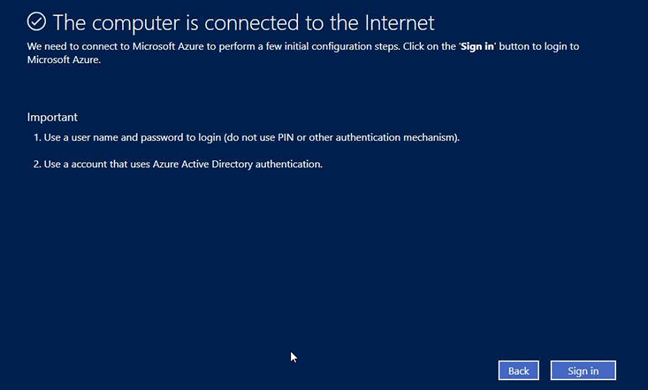 Once an Internet connection has been established, we can then sign into the Azure Portal. Now we need to sign into Azure with some credentials, ideally with a privileged/Global Administrator account. 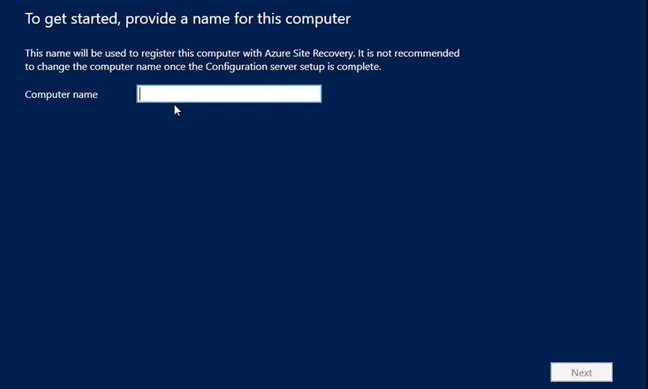 Once you have logged into Azure successfully, you will need to reboot the server. 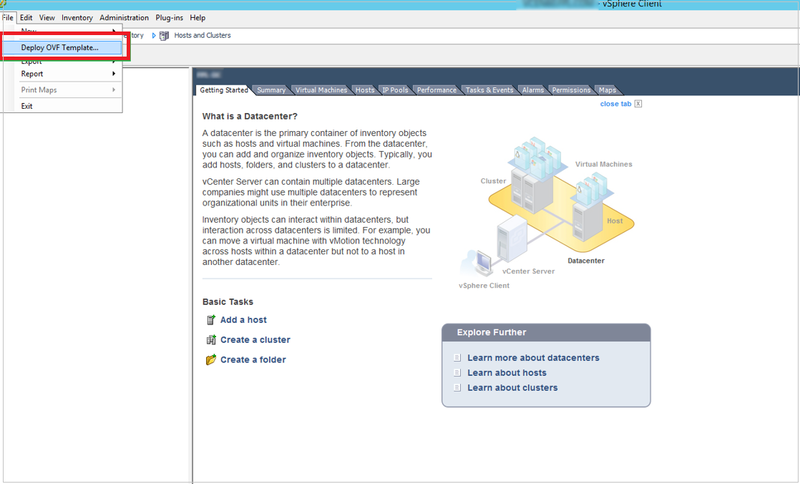 Once the server is back online, the next steps is to configure the Configuration server. 🙂 This step we will register this server/vCenter appliance with our Recovery Services vault. Let’s begin! The server will auto-launch the ASR wizard, if not, launch it from the desktop icon. Now that we have established an internet connection, we can configure our Network Interface Card(s) (NICs). Note, you can add as many as NICs needed, however, this needs to be done at the vSphere level. Once the server has been configured, you cannot add and/or remove those NICs. So, make sure you have it configured exactly as you need it. In my case, we will only need one, so, we will configure the NIC here. Next, our server will download, install and configure MySQL on the server, along with the vSphere PowerCLI tools. Gotcha, here, the appliance did not provide the vSphere PowerCLI tools, so we had to manually download, and install it. 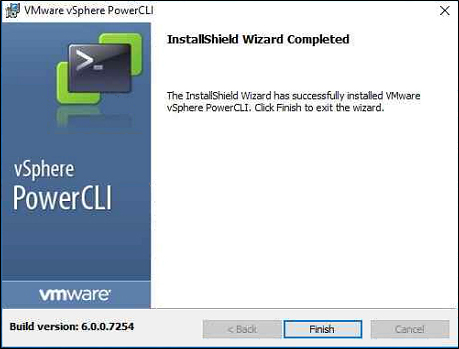 Once we downloaded VMware’s vSphere PowerCLI toolset, we were able to continue. As mentioned, this was not provided, although it should have been. If we continued forward, the wizard would have thrown an error at the end of validation. Next, we need to now provide the credentials and information with regards to our vCenter server(s). 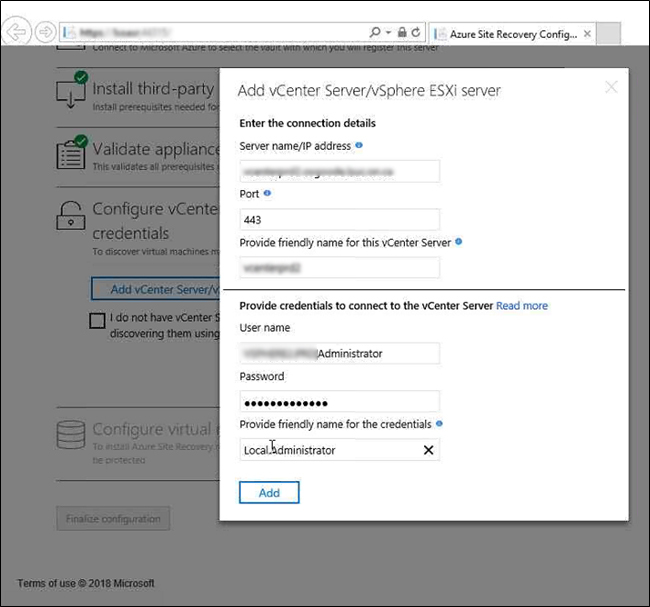 Please read the prerequisites with regards to the needed permissions to allow our ASR Configuration server to communicate with the vCenter server(s). 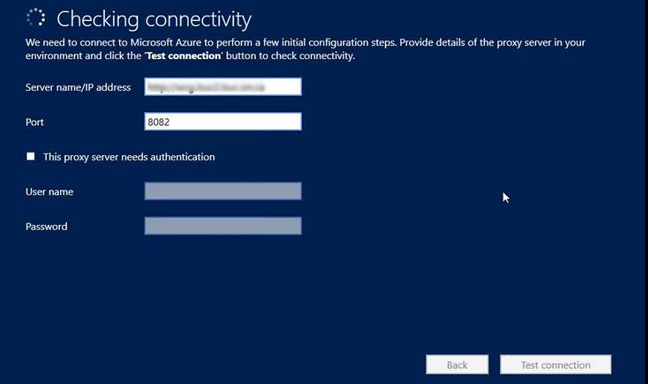 Next we need to provide Windows and Linux based credentials to deploy install the ASR Mobility Service to all machines that will need to be replicated to Azure. 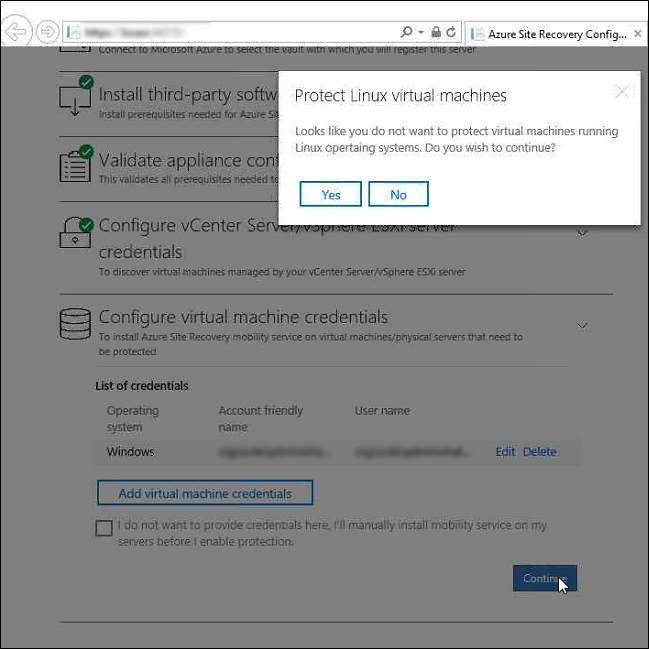 For this exercise, we are not replicating Linux machines to Azure, however if we were, similar to the Windows Mobility Service, we would need to provide some credentials that have elevated access to each of the Linux machines. 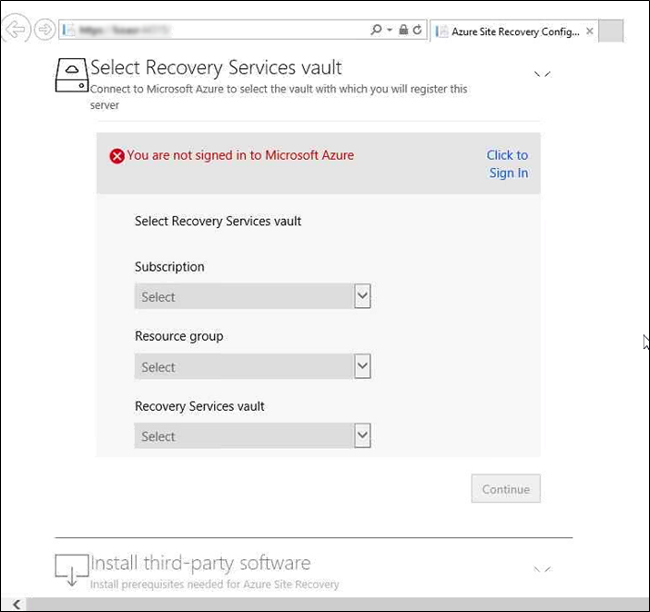 Once we have provided all the information above, we should now be able to validate some of the settings we have provided, and register our server with Azure and the Recovery Services vault. Give this a few minutes, as it took about 5 minutes to establish the communication/trust. 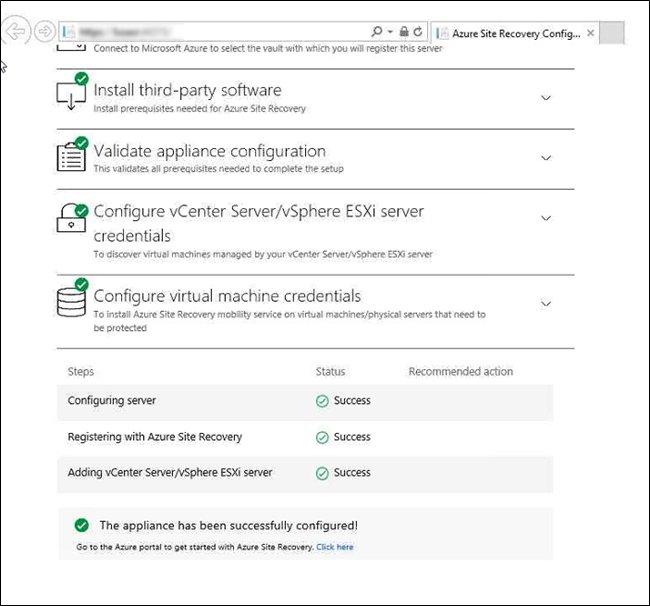 Once the registration of the server is complete, and the ASR appliance is officially configured with our Azure Recovery Services vault, we should now be able to see the vCenter/Configuration Server within our Azure Recovery Services vault. We can also now click on the Process Server and get some additional information as well. Now we are able to select the VMs we want to begin replicating to Azure and start testing failovers, either real, or simulated. So, you deployed the OMS/Log Analytics AD (Active Directory) Assessment solution, and let it sit for a few hours, or maybe even a few days now.. Yet, the AD Assessment tile is still shows, “No Data Found“…. Well that is frustrating! 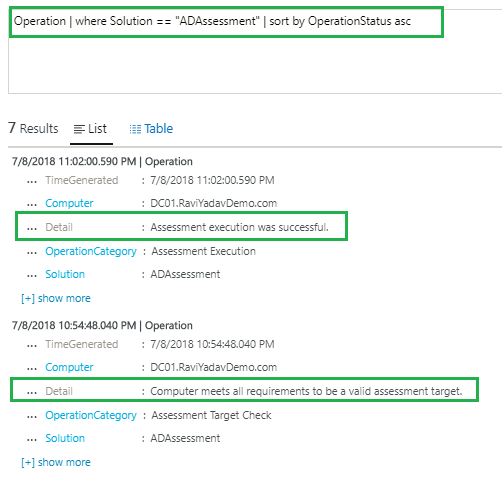 Below is the series of steps I took to get this working, and ultimately what the actual solution was to get this OMS/Log Analytics solution pack working. 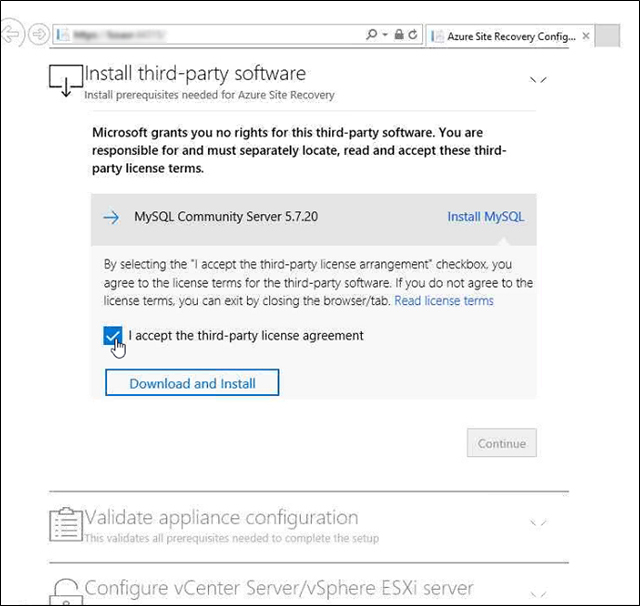 First things first, did the basics… Check to ensure the Microsoft Monitoring Agent is deployed, and installed correctly. Also checked to see the service was running. 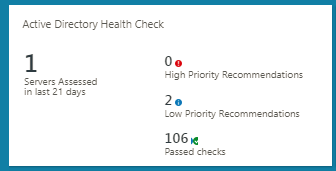 The Active Directory Health Check solution requires a supported version of .NET Framework 4.5.2 or above installed on each computer that has the Microsoft Monitoring Agent (MMA) installed. The MMA agent is used by System Center 2016 – Operations Manager and Operations Manager 2012 R2, and the Log Analytics service. The solution supports domain controllers running Windows Server 2008 and 2008 R2, Windows Server 2012 and 2012 R2, and Windows Server 2016. 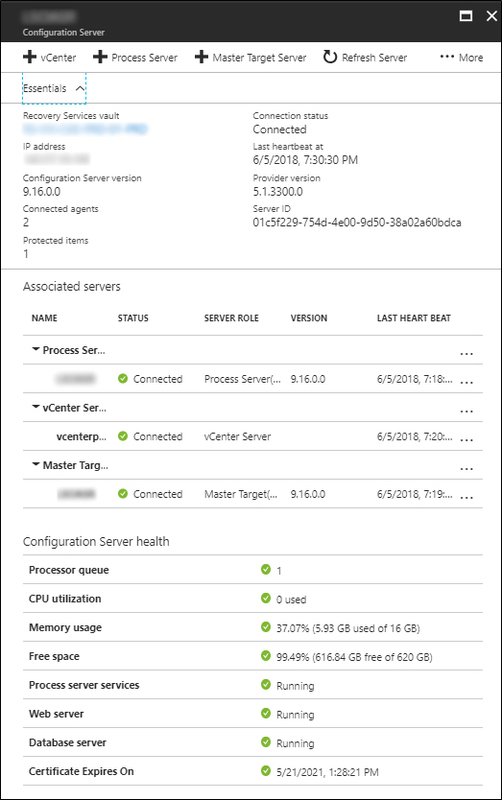 A Log Analytics workspace to add the Active Directory Health Check solution from the Azure marketplace in the Azure portal. There is no further configuration required. Okay, so I ensured .NET 4.0 was installed, fully. For safe measures, I enabled all of the .NET 4.6 sub-features, and for kicks, installed .NET 3.5 as well. Yet.. still nothing! I decided to delete the “LastExecuted” key, and then decided to reboot the server…. 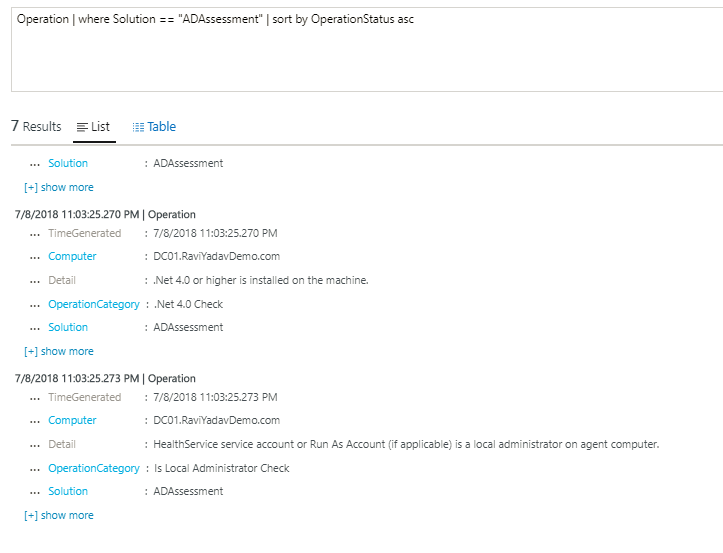 After a few minutes, I went back to the OMS/Log Analytics portal, and there it is!!!! Great! Now, if I click within the tile, I get the following AD Health Checks. This May, MVPDays will be hosting their May installment of MVPDays Conferences. On May 23rd, I will be speaking on Azure Application Insights. This event is free, and open for everyone and anyone that has an interest in technology, is eager to learn, and wants to meet other like minded individuals. This conference is not just for Microsoft MVP’s, it is for anyone in the IT Community! To find out more and to register for MVPDays, please visit, https://www.eventbrite.ca/e/mvpdays-virtual-conference-may-23-2018-tickets-45274909473?aff=es2. 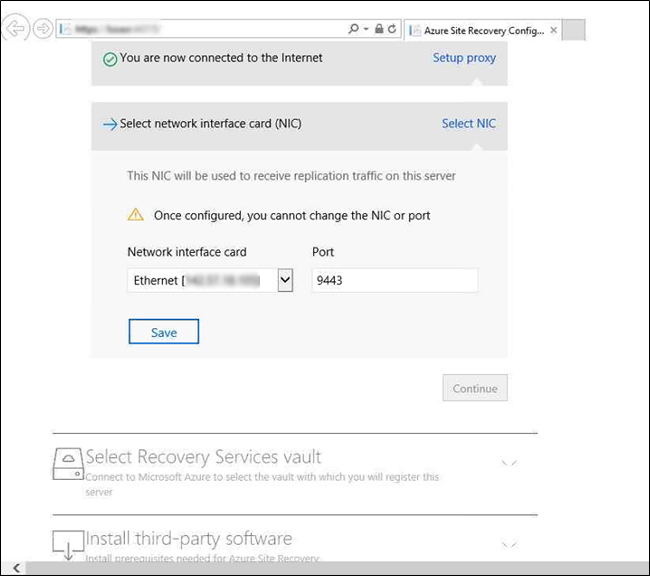 By default, every Azure virtual machine has RDP (Remote Desktop Protocol), port 3389 enabled, and allows any RDP connection from any IP in the world. As great as that is, this can be a (huge) security risk. 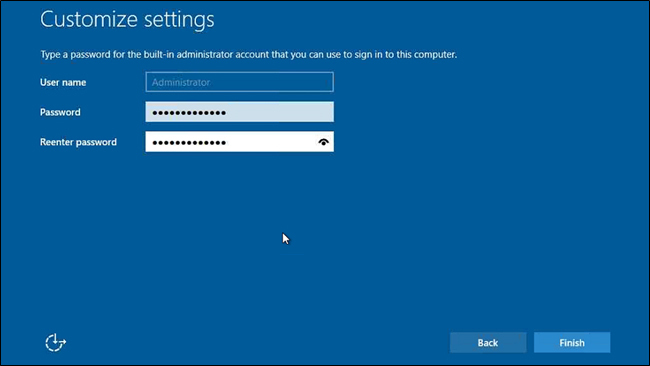 So, what if we want to change this, and limit who has RDP access to the VM? What if we want only a select range of IPs, or a specific IP to only have access to the VM(s)? For example, your branch office has a static public IP, and we only want RDP access from this IP/location. How can we achieve this? 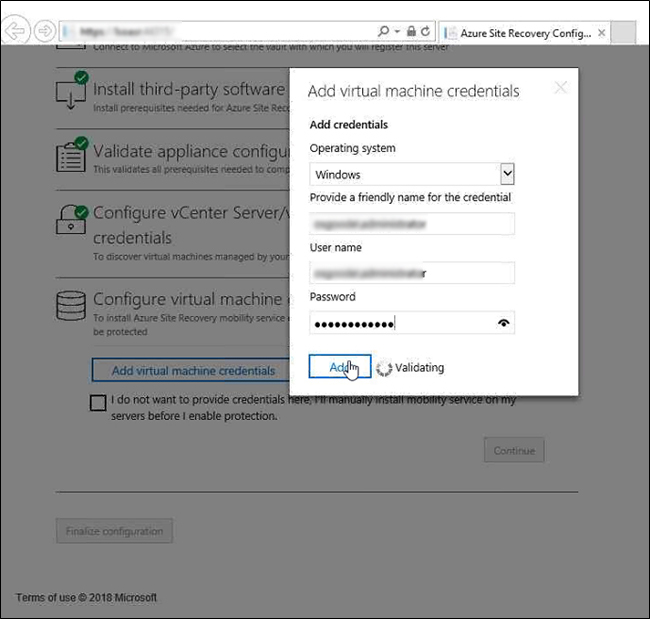 Restricting RDP access your VMs in Azure isn’t difficult, but does require some knowledge of Azure Network Security. The solution can be achieved by making use of Azure NSG’s (Network Security Groups). Every VM will have an NSG when it is deployed. If you create an NSG beforehand, you can simply apply the same NSG to new VM deployments. In the example below, we will need to create 2 NSG’s. Let’s begin, if you go into the property settings of the VM, and select the Networking Settings, and select, “Add inbound port rule“. Click on the wrench, to switch from Basic to Advanced. Wait, what do all of these fields mean? Source: The source can by any IP Address, or CIDR Range, or a default-service tag. Source IP Address/CIDR Ranges: Any IP Address, or CIDR Range. Azure Traffic Manager: Denotes the IP address from where the Azure Load Balancer health probes will origiante. Source Port Ranges: You can use either a range of ports, or use a Wildcard (*) for all ranges. Destination: The source can by any IP Address, or CIDR Range, or the Virtual Network. Destination Port Ranges: You can use either a range of ports, or use a Wildcard (*) for all ranges. Protocol: TCP or UDP, or Any, which includes both TCP and UDP, and ICMP. Action: Allow, or Deny access. Priority: A number between 100-4096. The lowest is 100, and the highest we can input is 4096. Lower the number, higher the priority. Name: The name of the rule. Note, once created, it cannot be changed! The Outbound Port Rules should look something like this now. Why we set Priority the way we did… Well, Rules are checked in the order of priority. Once a rule applies, no more rules are tested for matching. Once the rules has been submitted, and accepted, and if we try to RDP into the VM we should now only be allowed from the IP Range, or IP! Success! !